Raoul said: "The "Red Star" is one of Marburg`s oldest left bookstores. There you can find literature on any topics, included gender studies, left politics and policy etc... And of course also for friends of novels the Roter Stern offers a lot. I think they also offer books in French and other languages. Also I can recommend you the cafe directly behind the store. Like the Red Star it is self-administrated and has a anti-racist and anti-sexist principles. The food there is also great!" The selection of books available in this store is mostly focused on political subjects, with an obvious leftist inclination - critical theory, human rights, the Third world, negative effects of globalization, poststructuralism, alternative historical perspectives, leftist ideologies etc. - but it also has sections with fiction and children's literature, which are worth noting. Besides new books, the store also holds a second-hand section. Though Roter Stern is not an exclusively English bookstore, a significant number of books is available in English. Definitely worth a visit especially if you're searching for some alternative to mainstream information sources on any given topic. A political bookstore located in a town, which is known for the slogan: "Other cities may have a university, Marburg is a university." 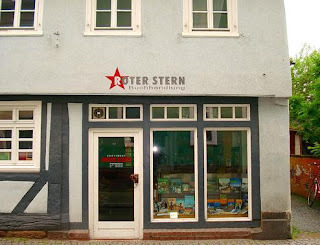 The bookstore Roter Stern was founded in 1969 and it has managed to hold on to its strong political conviction quite straightforwardly stated in its name and logo ever since. This is true not only for the selection of books that it offers (strong focus on releases from small independent publishers aimed mostly at non-mainstream critical theory), but also for the internal policies and organization of the store (no formal hierarchy, no boss, equal share of working hours and democratic process of decision making).